I don't know if I've ever been more excited to go to the market than I was this last weekend. I always get so eager for market days once the holidays end and spring draws near. With fresh flowers on my mind and tulip season in sight, the only thing that has been holding me back is this darn weather! The rain here in Seattle has been something dreadful lately, so when we had a brief moment of clear sky on Saturday, I took it. Apolis has a wonderful approach to producing their bags. The female artisans who handcraft them receive Fair Trade wages, annual profit dividends, and a retirement fund. How amazing is that? They're also made with superb quality. These bags are strong enough to hold at least 135 pounds, and have a waterproof interior that's easy to wipe clean. My first tulips of the season! They're still pretty little since it's till technically winter, but I know as it gets warmer I'll start to see more variety and color pop up at the market! Little details I love most about this bag are the leather straps, which make the handles nice and sturdy, and the interior pocket perfect for your phone or lipstick! Plus, let's not forget it's personalized! The hardest problem you'll have is deciding what you want it to say! If you can't make up your mind though, Apolis has plenty of pre-made options in their City Series. May I suggest Seattle? Thanks so much Apolis for this beautiful bag. I can't wait to use it on many market trips to come, and proudly let everyone know where it came from! 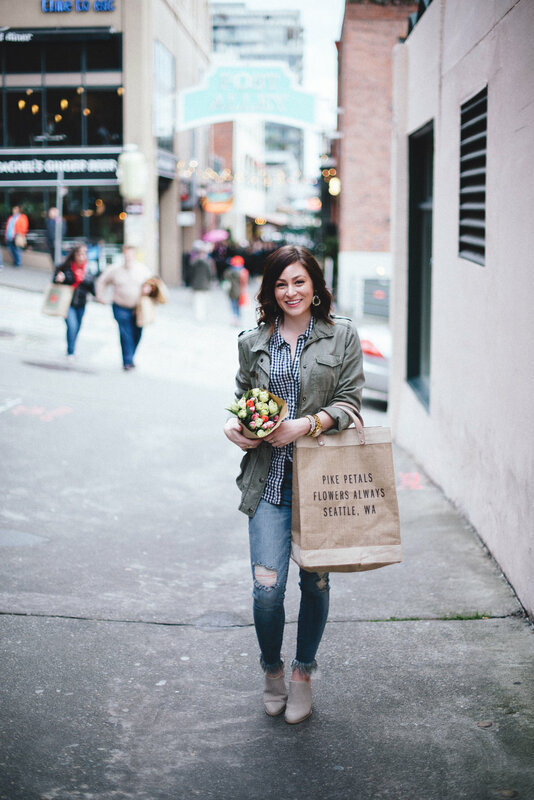 Want to snag your own City Market Bag? Use code pikepetals for free shipping on your order today!